Jim Kaighin from Marsh Harbour, Bahamas won the 2016 RC Laser National Championship Regatta, sailing amongst some of the most talented competitors in all RC sailing, beating Danny Thomas by one point and Dave Brawner (reigning national champion) by ten points. 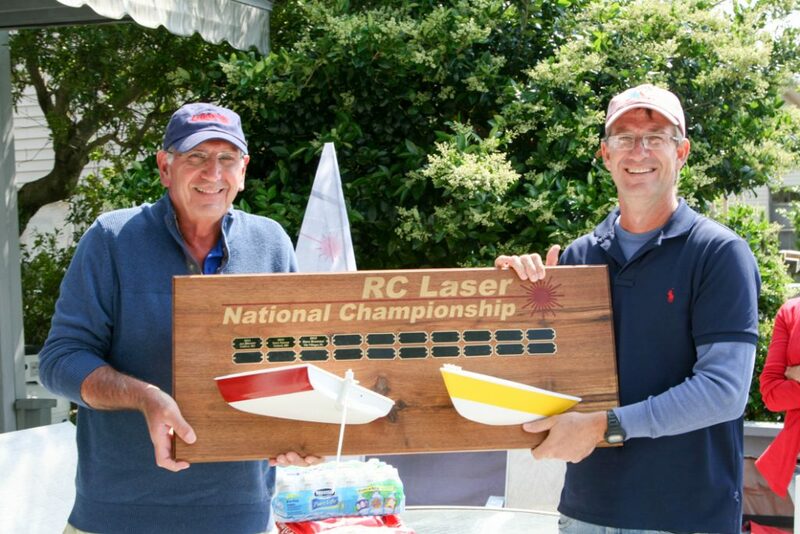 This year’s regatta was sailed on beautiful Lake Christopher in Virginia Beach, VA, and was hosted by a new AMYA RC Laser fleet, Tidewater RC Laser Fleet. Fleet Captain and regatta host Duncan Bell and his wife Karin could not have been more hospitable in all aspects of the event. Lake Christopher is a 63 acre (former quarry) lake with reported depths of 90 feet, and is located within the Lake Christopher community. Friday’s practice and Saturday’s seeding races were held at the lake’s west side community park. It seemed like it was designed for RC racing, with convenient parking, great dock for launching, and plenty of room for skipper’s sailing. Added was a forty foot long tent to use as shade, with enough room to sail from if it rained. Friday afternoon the skippers started arriving to have boats inspected, pick up their skippers package and get in a few practice races. Later in the day the rain came, moving the fleet under the large tent to practice from there. Friday night’s get together was at a local restaurant, Smokey Bones. Race Host, Duncan Bell couldn’t have chosen a better place. The Vagabonds and Jersey Boys found a new home! Saturday’s odd/even races started with southwest light breeze for the two lap course. This is the day that all skippers sail against each other to make the gold/silver fleets for Sunday’s Championship races. By the end of the seventh race Dave Brawner lead the fleet with just eight points. Danny Thomas and Jim Kaighin were tied with thirteen points each, Dave Ramos with seventeen and Jim Flach, fifth with 20 points. Saturday’s first place finishers were, Brawner 4, Kaighin 3, Rummage 2, Thomas 2, Oberg 1, Ramos 1. The whole fleet met at Smokey Bones for a second night of great food and lots of fun. To end the evening, the RC Laser boys’ choir sang Happy Birthday to fellow skipper Ryan Lippincott. Sunday’s weather changed big time. The temperature dropped twenty degrees and the wind direction changed to the worse possible direction. Coming right over our heads and going away from us. Plan B. Super Hosts Duncan and Karin opened their back deck and dock to us as well as their neighbors to sail on the other side of the lake. This is the Tidewaters venue, off of Duncan’s deck so it’s not unusual for the neighbors to come out and watch. Race directors Ken Shaw and Skip Hall worked wonders in setting the best possible courses for the Gold and Silver fleet racing. The day started with B sails and soon everyone was using C sails. For some this was the first time utilizing these sails. By the end of the fourth race the two leaders emerged, Kaighin and Thomas. It was a race to the finish. When the one throw-out per day was figured in it was Jim Kaighin winning the championship by one point over Danny Thomas. Top five finishers, Jim Kaighin 28pts, Danny Thomas 29pts, Dave Brawner 38pts, Ryan Lippincott 48pts, and Roger Vaughan 51pts. First Place finishes in the gold fleet, Thomas 2, Brawner 1, Flach 1, Kaighin 1, Ramos 1, Seidelmann 1. Prior to the Gold and Silver fleet awards, two special awards were given. Top Woman Sailor went to regatta host Karin Bell, Top Home Fleet Awards went to Duncan Bell. The Silver fleet is made up of those skippers who just haven’t found their way to gold fleet racing yet. Or maybe had a bad race and didn’t make the cut. This is the best racing to watch. There is lots of cheering from the gold fleet skippers as they watch friends sail. 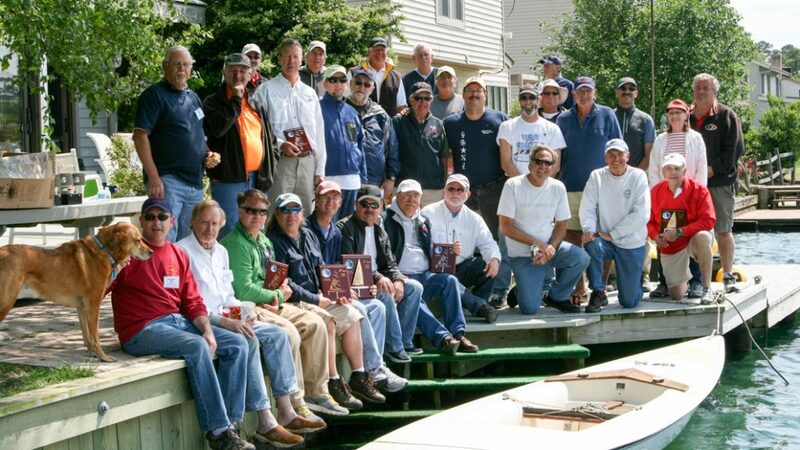 Dave Branning won the silver fleet by 24pts over second place finisher Rick Ferguson. This is Branning’s third silver fleet win. For third place it was a tie between Harry Henkel and Duncan Bell, with Harry winning the tie breaker. Race winners were, Branning 3, DeSantis 1, Ferguson 1, Henkel 1. I am very grateful for the team that put this regatta together; Dave Brawner who at a moment’s notice took the 6 hour Ride to look at Lake Christopher and 6 hours back in the rain, Duncan and Karin Bell who were the best regatta hosts and event organizers, Race Directors Ken Shaw and Skip Hall, and my wife, Beth who puts all the regatta stuff together. Also a special thank you to Jim Flach, who is our information director, Jim Myers who jumped right in with his support of the class, and the entire Tidewater RC Laser Fleet. Thank you all !!!! !